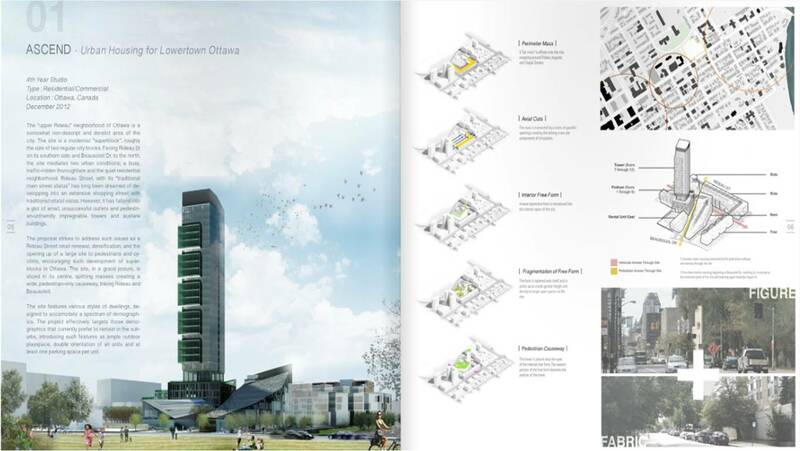 A portfolio should reflect the architectural and aesthetic sensibilities of the student. It is a great way of communicating what you believe in, in highlighting your strengths and skills. That being said, an architectural portfolio is a professional document and one must make every effort to keep it as professional as possible, while highlighting your creative side. Keep your portfolio neat and simple. I can't stress that enough. Most of the designers appreciate portfolios that are clean, which can clearly communicate your design and creative works. You can always take inspiration from the simple clear design aesthetics of Apple. It was Steve Job's single minded pursuit for perfection which has thrown out all the unnecessary frills and helped evolved some of the most beautiful gadgets. An architectural portfolio should also be similar. The idea is not to create an overloaded graphical presentation, but one which would highlight your design work and would communicate it in a clear legible manner. Today there is a plethora of presentation and graphical softwares which can create awe inspiring images. 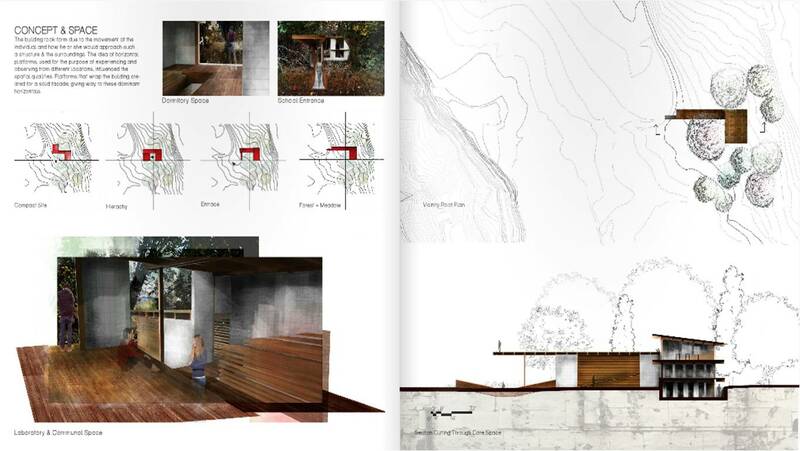 But keep in mind that ultimately it is not the fancy graphics that will have to be the highlight of your architecture portfolio. 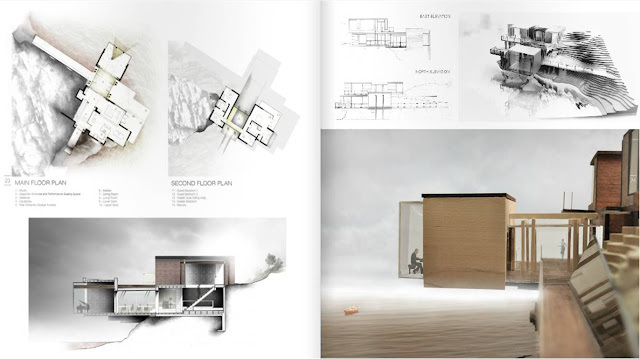 But always keep in mind that it is always a design portfolio and that design must take precedent. Please avoid unnecessary personal details and 'cool' personal photographs. If you must add your picture, please keep it relatively straightforward. Most of the portfolios that I get include ‘photography’ as one of the skill sets. Today, with the plethora of good quality cameras and editing softwares, almost everyone is an amateur or semi-professional photographer. Thus unless you really are passionate about photography and have got some good photographs, it is always best to avoid adding random clicks as your photography work. 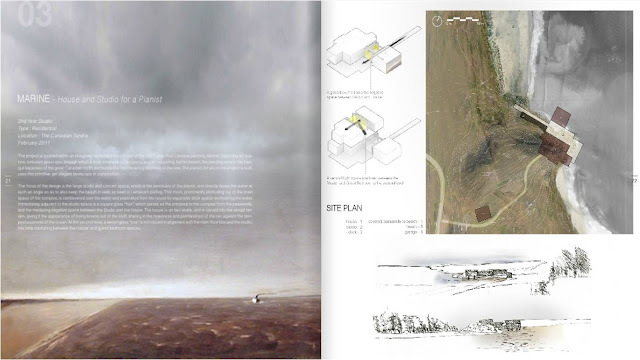 As an architect, one is expected to be able to communicate your ideas through sketches and drawings. It is a skill that most of the architects look for in students. That being said, not everyone can effectively communicate through good sketches. If sketching is not your cup of tea, I would advise that you do not forcefully include poor sketches just for the sake of adding it, but highlight other skill sets like graphic abilities. Always try to include as much hand drawn content as possible in your portfolio and while doing so, ensures that the sketches are scanned properly in good resolution (300 dpi always) and that the lines are clear. Pay attention to your fonts and text. Today, there are plenty of fonts which can be used to create eye catching content in your portfolio. Use fonts judiciously to create an order. Be extremely careful in all the content that you include. All the text must be checked for grammatical mistakes. Always, and I mean always, use spell-check on all your content in your portfolio. It is not at all acceptable to have basic spelling mistakes in your portfolio. It would mean that you are not professional enough in your work. Writing quality content is again another challenge for any architectural student. Add only that text which you feel is absolutely essential. Avoid giving too elaborate write-ups explaining your designs and ideas. 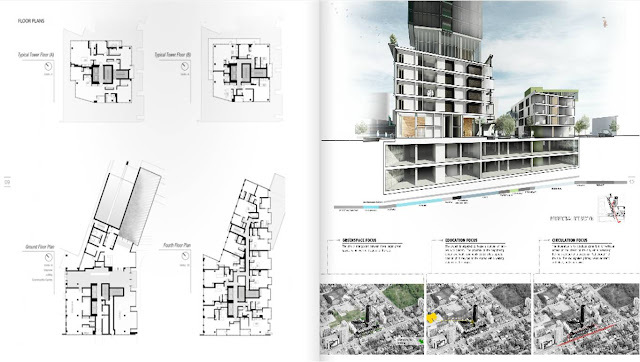 Most of the architects are not going to ever read through the whole text. So, keep your writing to the minimum and let your drawings do the talking. And always ensure that only relevant and grammatically correct content is included. If on the other hand you are good at writing, let it come through in minimal sentences which would capture the essence of your design. Finally, don't be afraid of white spaces! You do not need to crowd your whole layout, cramming tons of stuff in it. Make white spaces work in your favour by their judicious use. However, this has to be handled carefully, as too much white can lead to a blank look. So use your aesthetic sense and decide the optimum amount of content vs white space. 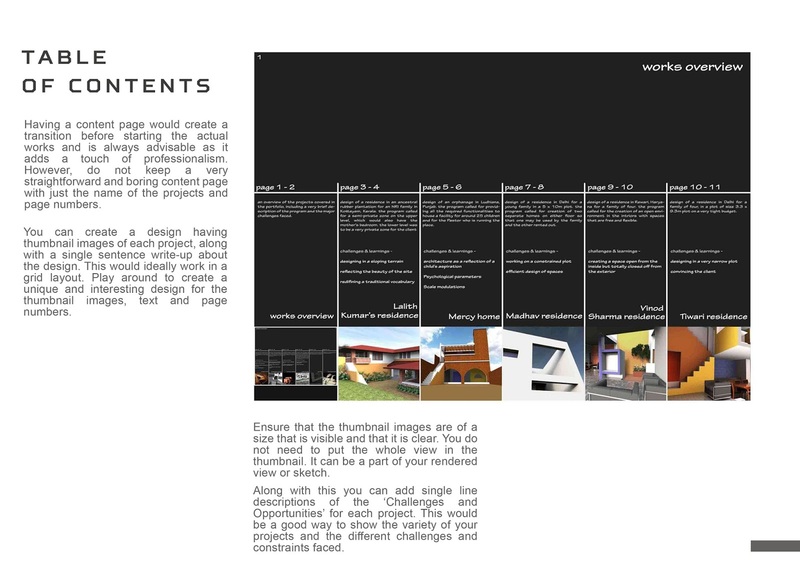 I've created a detailed booklet on how to go about creating your Architecture Portfolio, covering all the other areas to be given thought to.. There is detailed coverage on each aspect of your portfolio, with a lot of tips to help you create that perfect portfolio. FOR A DETAILED BOOKLET ON 'HOW TO PREPARE YOUR ARCHITECTURE PORTFOLIO', EMAIL ME AT ar.sujithgs@gmail.com. Don't miss this wonderful opportunity! A sample page from the booklet!